Gurpreet Singh, assistant professor of mechanical and nuclear engineering, and Lamuel David, doctoral student in mechanical engineering, India, published their findings in the Journal of Physical Chemistry in the article "Reduced graphene oxide paper electrode: Opposing effect of thermal annealing on Li and Na cyclability." 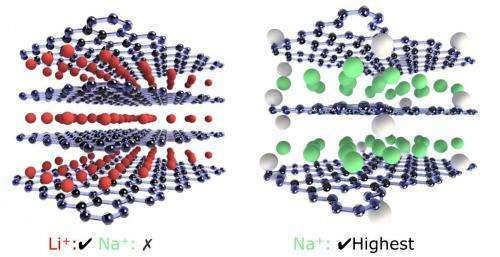 "The observation is important because graphite, which is a precursor for making graphene oxide, has negligible capacity for sodium and has long been ruled out as viable electrode for sodium-batteries," Singh said. "Graphite is the material of choice in current lithium-ion batteries because the interlayer spacing is just right for the smaller size lithium ions to diffuse in and out." "Most lithium electrode materials for sodium batteries cannot even last for more than a few tens of charge and discharge cycles because sodium is much larger than lithium and causes enormous volume changes and damage to the host material," Singh said. "This design is unique because the distance between individual graphene layers is large enough to allow fast insertion and extraction of the sodium ions, thanks to the oxygen and hydrogen atoms that prevent sheets from restacking." "Such measurements and study of failure mechanisms are important for designing long-life batteries because you want the electrode to be able to expand and contract repeatedly without fracture for thousands of cycles, especially for larger nonlithium metal-ion batteries," Singh said. "These days, almost every one is using crumpled graphene as either the conducting agent or elastic support or both." "It is only now we realize that sodium capacity of graphene, or rGO, is dependent on its processing temperature," Singh said. "The rGO specimens in our previous study were prepared at 900 degrees C."
Singh and his team will continue exploring new nanomaterials and focus on materials that can be mass-produced in a cost-effective manner. "We would like to perform fundamental studies to understand the origins of first cycle loss, voltage hysteresis, and capacity degradation that are common to metal-ion battery anodes prepared from 2-D layered crystals such as transition metal chalcogenides, graphene, etc.," Singh said. The researchers are also looking at other nanomaterials that have been ruled out as battery electrodes, such as boron nitride sheets and silicon-nitrogen based ceramics.